What is the Sardana SCADA and how do I get an overview over the different components? How do I install Sardana? How to work with Taurus GUI? How to produce your own Taurus GUI panel? How to write scan procedures? How to adapt SARDANA to your own hardware? How to add your own file format? How to use the standard macros? How to write your own Taurus application? Which are the standard Taurus graphical GUI components? How to write your own Taurus widget? How to work with the graphical GUI editor? What are the minimum software requirements for sardana? How to configure the system? How to write your own Taurus schema? What are the interfaces to the macro server and the pool? What are the data file formats used in the system and how can I read them? What is the file format of the configuration files? The basic Sardana SCADA philosophy can be found here. The complete sardana installation instructions can be found here. A user documentation for the Taurus GUI application can be found here. The basic philosophy of Taurus GUI is to provide automatic GUI s which are automatically replaced by more and more specific GUI s if these are found. spock offers a command line interface with commands very similar to SPEC. It is documented here. Procedures can also be executed with from a GUI. Taurus provides generic widgets for macro execution. Procedures can also be executed in specific GUI s and specific Taurus widgets. The API to execute macros from python code is documented here <LINK>. In addition of the strength of the python language macro writers can interface with common elements (motors, counters) , call other macros and use many utilities provided. The macro API can be found here. Sardana is meant to be interfaced to all types of different hardware with all types of control systems. For every new hardware item the specific behavior has to be programmed by writing a controller code. The documentation how to write Sardana controllers and pseudo controllers can be found here. This documentation also includes the API which can be used to interface to the specific hardware item. Documentation how to add your own file format can be found here <LINK>. The list of all standard macros and their usage can be found here <LINK>. You have basically two possibilities to write your own Taurus application Start from get General TaurusGUI and create a configuration file. This approach is documented here <LINK>. Start to write your own Qt application in python starting from the Taurus main window. This approach is documented here <LINK>. A tutorial of how to write your own Taurus widget can be found here. Taurus uses the QtDesigner/QtCreator as a graphical editor. Documentation about QtDesigner/QtCreator. The Taurus specific parts here. Sardana is developed under GNU/Linux, but should run also on Windows and OS-X. The dependencies for installing Sardana can be found here <LINK>. Adding and configuring hardware items on an installation is described here <LINK>. 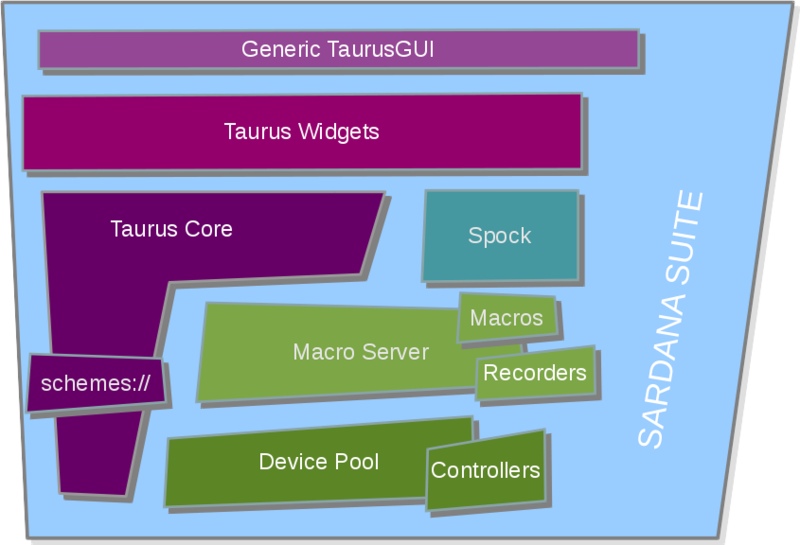 The low level interfaces to the Sardana Device Pool and the Macro server can be found here <LINK>. The configuration files for the Taurus GUI are defined here <LINK>.